The General Court Martial has refused to grant bail to Nixon Agasirwe, the senior police officer, who along others, is accused of kidnapping a former body guard to Rwandan president Paul Kagame in 2013. In his ruling, the court martial chairman, Lt. Gen. Andrew Gutti, said if set free, Agasirwe will use his seniority in the police to interfere with investigations. “The applicant’s prominence would interfere with the investigations and influence witnesses. We also find the sureties not capable of prevailing over such a high ranking officer to make attend court whenever he is required,” ruled Gen Gutti. He added that Agasirwe’s sureties, Mr Fortunate Habyala and Mr Andrew Kaggwa, all police officers, were not authorized by Inspector General of Police, in line with the Police Standing Orders. Agasirwe’s co-accused, former commandant of Police Professional Standards Unit Joel Aguma, and Sgt Abel Tumukunde had also been denied bail. However, Faisal Katende, formerly working with the Police Flying Squad, James Magada and Amon Kwarisiima from Crime Intelligence were granted bail. Prosecution alleges that on October 25, 2013 at Kamengo in Mpigi District on Masaka Road, the suspects while in unlawful possession of firearms and grenades, ordinarily a monopoly of defence forces conveyed Lt Mutabaazi without his consent to the Republic of Rwanda. 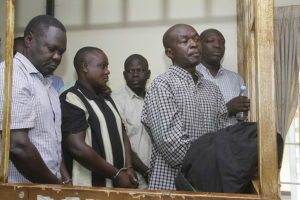 Prosecution further alleges that on the same day, the group also conveyed a one Jackson Karemeera also known as Ndinga. Lt Mutabaazi a former guard in President Paul Kagame’s Republican guard was allegedly kidnapped in Kampala by security personnel and handed over to his home government. He was sentenced to life imprisonment.